A tangent located between two bends made on the same section of tubing. Compare end tangent; also see tangent. 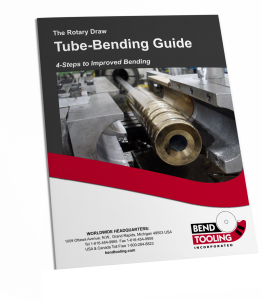 The mid-tangent becomes an important consideration in tool design and machine process if its length is shorter than the recommended clamp length for the tube-bending application. In those instances when a short mid-tangent compromises the optimal clamp design, a conflict arises between ease-of-bending and bend quality that often is not resolved unless compound clamps are used. See the entries under clamp die and compound clamp for a full treatment of this issue.